Always be humble and gentle. Be patient with each other, making allowance for each other’s faults because of your love. Living as becomes you] with complete lowliness of mind (humility) and meekness (unselfishness, gentleness, mildness), with patience, bearing with one another and making allowances because you love one another. 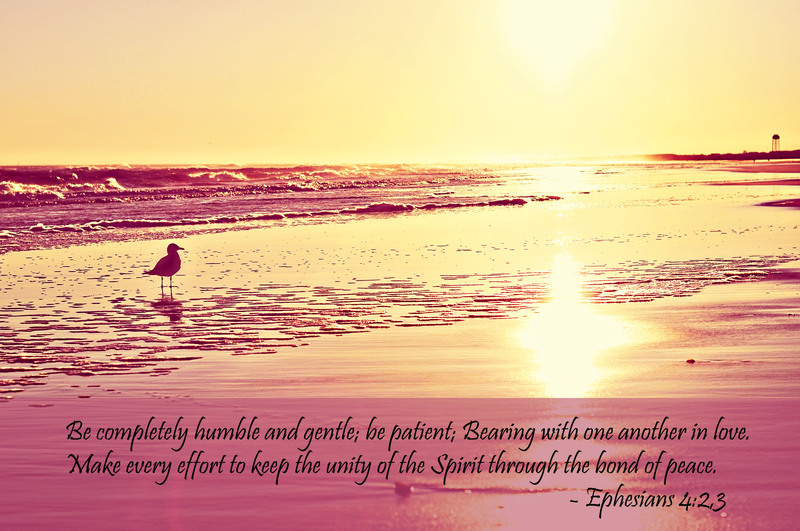 This verse offers another reminder to live in humility and meekness with patience whereby we endure or bear up under, and “put up with,” making allowances for one another because we love one another. Patience is the golden strand woven throughout the gnarled threads that comprise the tapestries of our lives. As believers we are exhorted to wait patiently for the return of Christ who is our blessed hope. We are encouraged, not only to wait for him but to wait on him, as we serve one another in love. 4 Love is patient and kind. Love is not jealous or boastful or proud 5 or rude. It does not demand its own way. It is not irritable, and it keeps no record of being wronged. 6 It does not rejoice about injustice but rejoices whenever the truth wins out. 7 Love never gives up, never loses faith, is always hopeful, and endures through every circumstance. Above all, have fervent and unfailing love for one another, because love covers a multitude of sins [it overlooks unkindness and unselfishly seeks the best for others]. 7 Dear friends, let us continue to love one another, for love comes from God. Anyone who loves is a child of God and knows God. 8 But anyone who does not love does not know God, for God is love. 9 God showed how much he loved us by sending his one and only Son into the world so that we might have eternal life through him. 10 This is real love—not that we loved God, but that he loved us and sent his Son as a sacrifice to take away our sins. 11 Dear friends, since God loved us that much, we surely ought to love each other. For you have need of steadfast patience and endurance, so that you may perform and fully accomplish the will of God, and thus receive and carry away [and enjoy to the full] what is promised. 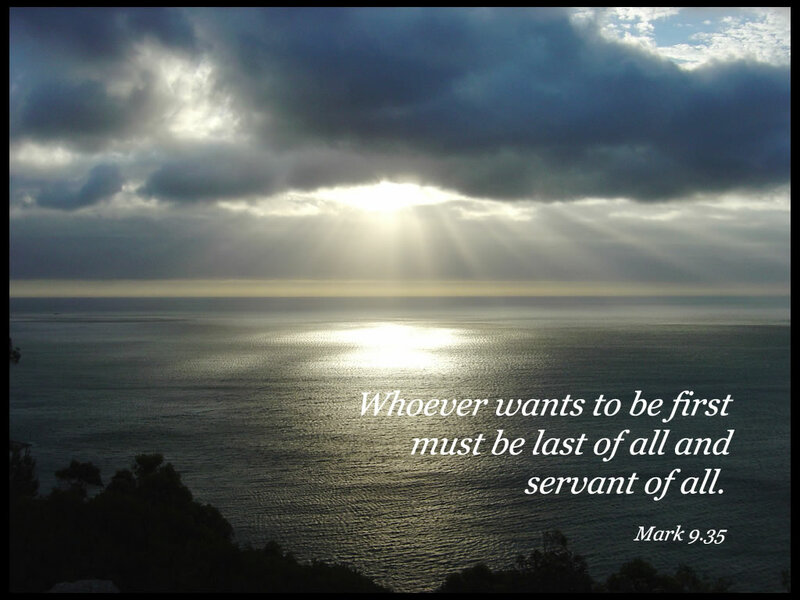 Revised and re-posted from a previous entry, the Verse of the Day for January 29, 2016 speaks of the oxymoronic nature of true servanthood: the last shall be first and the first shall be last. If you want to be in the premier position as number one, then put yourself in the last position by putting others first, and you will be great. But among you it will be different. Those who are the greatest among you should take the lowest rank, and the leader should be like a servant. and whoever wants to be first among you must become your slave. In following in the steps of Jesus Christ, one of the most noble character traits that a person can demonstrate is that of serving others. Throughout the life and ministry of Christ, he takes upon himself the form of a servant, thus modeling the behavior that he desires to see his followers emulate. In the New Testament we find that the metaphor of the servant or bondslave is used in the Bible to portray this admirable heart of service. The distinction between the term “slave” and the “bond servant” which is translated from the Greek word doulos in the New Testament is that the servant or bondslave offers his life in “voluntary servitude.” Though often looked upon in a negative light, choosing to become a servant of the Lord is a most admirable character trait. To express my deep yearning for intimacy. Pulsates with lifeblood flowing from a servant’s heart. To serve with love from a heart filled with gratitude. Listen to “The Servant Song” by Maranatha! Promise Band, as we close this blog entry. Instead of the Verse of the Day, today’s devotional centers on a life-changing time of ministry entitled “Prayer Works,” part of a series of teachings by Bishop Charles Mellette of Christian Provision Ministries in Sanford, NC. The objective was to encourage and help believers to expect that their prayers of faith will produce results. 11 For I know the plans and thoughts that I have for you,’ says the LORD, ‘plans for peace and well-being and not for disaster to give you a future and a hope. 12 Then you will call on Me and you will come and pray to Me, and I will hear [your voice] and I will listen to you. 13 Then [with a deep longing] you will seek Me and require Me [as a vital necessity] and [you will] find Me when you search for Me with all your heart. We should pray and not give up. So that this judge was fed-up. As she raised such a ruckus. Gave in and answered her plea. And be just to the fullest extent. You have whatever you say. Prayer works for all who persist. 12 The night is far spent, the day is at hand: let us therefore cast off the works of darkness, and let us put on the armor of light. But since we [believers] belong to the day, let us be sober, having put on the breastplate of faith and love, and as a helmet, the hope and confident assurance of salvation. 12 Therefore, as the elect of God, holy and beloved, put on tender mercies, kindness, humility, meekness, longsuffering; 13 bearing with one another, and forgiving one another, if anyone has a complaint against another; even as Christ forgave you, so you also must do. 14 But above all these things put on love, which is the bond of perfection. your old sinful nature and all its wicked deeds. to know your Creator and become like him. As I strive to know levels of deepest intimacy. And put to death and mortify my members once for all. Not conformed, I transform myself, as new man, mature. And abide in my hiding place, filled with a grateful heart. Humble yourselves in the sight of the Lord, and he shall lift you up. This scripture reminds us that humility is the key to promotion. Of course, the ultimate example to illustrate such a paradox is the Lord Jesus Christ. 7 But stripped Himself [of all privileges and [rightful dignity], so as to assume the guise of a servant (slave), in that He became like men and was born a human being. 8 And after He had appeared in human form, He abased and humbled Himself [still further] and carried His obedience to the extreme of death, even the death of the cross! Whoever will humble himself therefore and become like this little child [trusting, lowly, loving, forgiving] is greatest in the kingdom of heaven. Whoever exalts himself [with haughtiness and empty pride] shall be humbled (brought low), and whoever humbles himself [whoever has a modest opinion of himself and behaves accordingly] shall be raised to honor. The essence of this discussion of the paradox of humility and promotion is so clearly expressed in the title prayer from a collection edited by Arthur Bennett: The Valley of Vision: A Collection of Puritan Prayers and Devotions. that to give is to receive, that the valley is the place of vision. Thy grace in my sin, Thy riches in my poverty, Thy glory in my valley. Without question, in terms of promotion with God, humility is the key. Indeed, the way down is the way up. This verse clearly relates how believers should think and serves as the foundational scripture for a blog entry based on words of advice, often directed toward children, but they certainly apply to children of God at any age. Edited and re-posted below is a devotional based on the statement: “Think before you speak.” When written as an acrostic, the word “T-H-I-N-K” was broken down into a series of questions with scriptures related to each of the questions asked. For as he thinks in his heart, so is he. As one who reckons, he says to you, eat and drink, yet his heart is not with you [but is grudging the cost]. The upright (honorable, intrinsically good) man out of the good treasure [stored] in his heart produces what is upright (honorable and intrinsically good), and the evil man out of the evil storehouse brings forth that which is depraved (wicked and intrinsically evil); for out of the abundance (overflow) of the heart his mouth speaks. The fear of the Lord is clean, enduring forever: the judgments of the Lord are true and righteous altogether. Thy word is true from the beginning: and every one of thy righteous judgments endureth forever. A true witness delivereth souls: but a deceitful witness speaketh lies. Let your speech be always with grace, seasoned with salt, that ye may know how ye ought to answer every man. And I myself also am persuaded of you, my brethren, that ye also are full of goodness, filled with all knowledge, able also to admonish one another. And we urge you, brethren, admonish the unruly, encourage the fainthearted, help the weak, be patient with all men. Although the Scriptures encourage us to always be ready to give an answer to everyone who asks, (I Peter 3:15), we may encounter situations whereby we should “hold our peace” and say nothing. Indeed, there are occasions when it may not be necessary to say what we have in mind. Indeed, Ecclesiastes reminds us that there is a time to speak and a time to refrain from speaking. All things are lawful for me, but all things are not expedient: all things are lawful for me, but all things edify not. 12 Clothe yourselves therefore, as God’s own chosen ones (His own picked representatives), [who are] purified and holy and well-beloved [by God Himself, by putting on behavior marked by] tenderhearted pity and mercy, kind feeling, a lowly opinion of yourselves, gentle ways, [and] patience [which is tireless and long-suffering, and has the power to endure whatever comes, with good temper]. 13 Be gentle and forbearing with one another and, if one has a difference (a grievance or complaint) against another, readily pardoning each other; even as the Lord has [freely] forgiven you, so must you also [forgive]. 14 And above all these [put on] love and enfold yourselves with the bond of perfectness [which binds everything together completely in ideal harmony]. And be ye kind one to another, tenderhearted, forgiving one another, even as God for Christ’s sake hath forgiven you. Brethren, if a man is overtaken in any trespass, you who are spiritual restore such a one in a spirit of gentleness, considering yourself lest you also be tempted. 2 Bear one another’s burdens, and so fulfill the law of Christ. In thinking on these two verses, my mind recalls a backpacking experience that occurred at TFI (Total Fitness Institute) in California back in December, 1975. During this outdoor wilderness adventure I was assigned to a platoon of believers, and we portioned out our food supply for the week among the group. I volunteered to carry the food for the last day, which meant that my load stayed the same while the load that everyone else carried got lighter. When I lay my burden down. That I could not forebear myself. His cross beyond all words can name. Have I resisted unto blood? Could I for joy endure such shame? The load is lightened by my friend. since I laid my burden down. The epigraph or short intro to the poem as well as the closing stanza are lyrics from an old gospel song that I recall my childhood days, recorded here by the Staple Singers. The album cover features the 15th Century painting entitled “The Adoration of the Lamb” by Hubert and Jan van Eyck. If any of you lacks wisdom, let him ask of God, who gives to all liberally and without reproach, and it will be given to him. The idea of pursuing wisdom brought to mind an incident that occurred almost fifty years ago. Having been drafted into the Army in 1967 during the Vietnam era, I was in basic training during the first weeks of the New Year. At the end of the training period, we were told to prepare for a thorough inspection of our barracks by the Inspector General. I recall that I had received my first pay which I had placed in the bottom of an empty stationery box that I had hidden underneath some of the clothing items that lined my footlocker. In my haste to prepare for the IG inspection, I inadvertently threw what I thought was an empty box into the trash which I later recalled having thrown into the dumpster behind the barracks. We passed the inspection with flying colors and our company performed well on the parade field, being selected as the group with the best formation. As a result we were given a pass to go into the neighboring town for the day. As I went to get my pay which I had stashed away, I realized that I had thrown my month’s wages into the trash, as I remembered what I had done in preparing my footlocker for inspection. Without hesitation, I walked swiftly to the back of the barracks and climbed into the dumpster. In pursuing the object, I ignored the strange looks and snide comments and inquiries that asked “Johnson, what are you doing? What are you looking for?” I walked over to the area where I recall that I dumped the trash, and I diligently searched for and finally found the box that contained the money that I was looking for. and the profit of it better than fine gold. Likewise, wisdom arouses me as I awake. Desire, a fire, flames the passion deep within me. Assured that all who pursue her shall also find. As one traces a winding river to its source. So I seek the Spirit of wisdom’s good pleasure. Reflecting on an experience that occurred almost fifty years ago, I recognize that I am still asking for wisdom while earnestly seeking to find knowledge, understanding and all the attributes of God. For everyone who asketh receiveth. And to him that knocketh, it shall be opened. In discussing Orientalisms or Eastern customs and manners found in Scripture, Bishop KC Pillai, converted Hindu Bible teacher, notes that eating with someone was a most intimate act. One did not eat with strangers or those outside his most intimate circle of family and friends. In that light, Revelation 3:20 takes on even more significance as an invitation to intimacy. Luke 24 speaks of Jesus and the disciples on the Road to Emmaus and of their breaking bread together, a time of intense intimacy when Jesus opened the eyes of their understanding that they might understand the Scriptures. This unfolding of Himself as revealed in the Scriptures occurred during a meal, a time of wonderfully rich fellowship and intimacy. In thinking about the passage from Matthew 7:7-8, we recognize that in the Greek New Testament the three verbs are expressed in the present progressive tense: meaning keep on asking, keep on seeking, keep on knocking. In the New King James Version we find a similar preface in brackets before the actual scripture. In the same manner that a child will keep asking for a treat while shopping with his or her parents, Jesus Christ says to continue to ask, continue to seek, continue to knock. Each day adds another victory toward our winning streak. Keep pressing toward the mark to obtain the prize we seek. 7 Do not be deceived, God is not mocked; for whatever a man sows, that he will also reap. 8 For he who sows to his flesh will of the flesh reap corruption, but he who sows to the Spirit will of the Spirit reap everlasting life. But this I say: He who sows sparingly will also reap sparingly, and he who sows bountifully will also reap bountifully. 15 Now you Philippians know also that in the beginning of the gospel, when I departed from Macedonia, no church shared with me concerning giving and receiving but you only. 7 So let each one give as he purposes in his heart, not grudgingly or of necessity; for God loves a cheerful giver.